I can’t seem to make it through a week without burning myself on a hot pan. I tried a new technique today. Instead of baking a pizza with all the toppings in one go, I baked the crust and sauce on a preheated, upside down sheet pan for 9 minutes at 500°F on the top rack. Then, I topped the par-cooked pizza with the cheese and toppings, and returned it to the oven for another 5 minutes to finish baking. Doing this helped the crust cook without burning the cheese (I like fresh mozzarella when it’s pillowy soft, not bubbling and brown). As always, I used my favorite dough recipe. 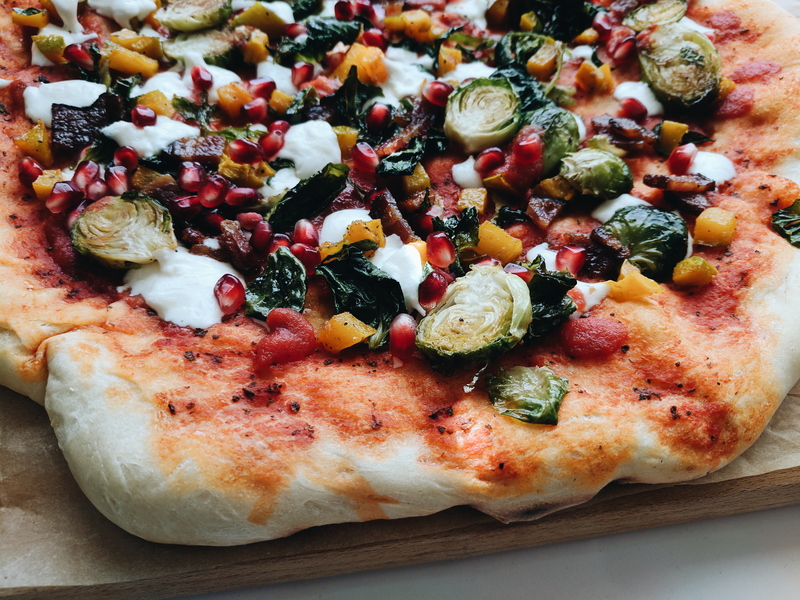 I topped the pizza with roasted Brussels sprouts, kabocha squash, and leftover bacon. Once out of the oven, I sprinkled on a handful of pomegranate seeds. 10/10, would recommend. 1/4 pound of thick cut bacon, brushed with maple syrup and brown sugar and baked on a rack until crisp. Mix together the warm water with the yeast, sugar, and olive oil. Let sit for about 3 minutes until foamy. In the bowl of an electric mixer, mix together the flour with a teaspoon of salt. Using a dough hook, turn on the electric mixer on low and slowly add the yeast mixture to the flour mixture until just combined. Continue mixing on medium until the dough is smooth and elastic, about 3 minutes. Turn the dough out onto a floured surface and knead into a smooth ball. Place the dough in an oiled bowl and cover with plastic wrap. Let the dough rise in a draft-free space until the dough has doubled in size, about an hour. Slice the Brussels sprouts and dice the squash into bite sized pieces. Drizzle with olive oil and toss with salt, pepper, and garlic powder. Roast in the oven at 400°F for 30 minutes, tossing halfway. Once the dough has doubled, divide it into two portions. Using your hands, flatten and stretch each portion into 16 inch rounds. 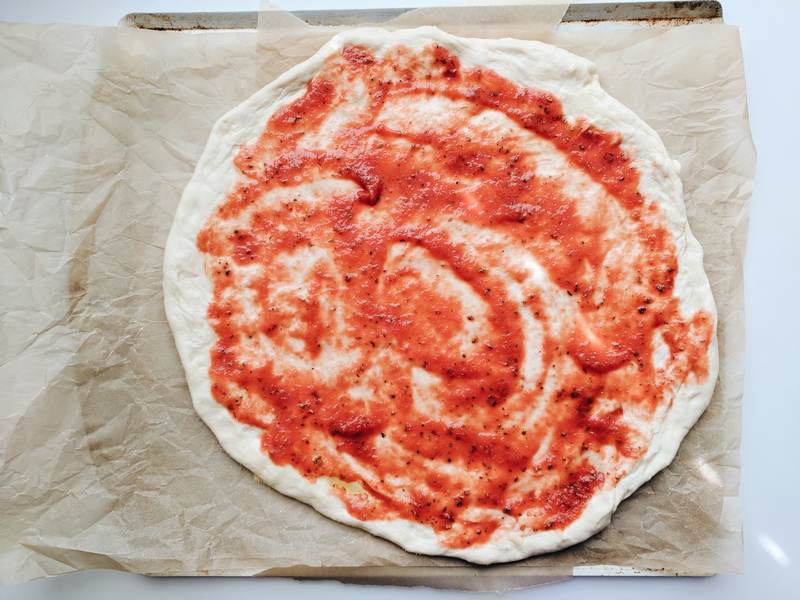 Place the pizza dough on parchment paper for easy transfer to the oven. Add salt, pepper, and dried oregano to the tomato sauce, if desired, and spread 1/4 cup of the sauce onto each pizza. Preheat a sheet pan or pizza stone in the oven at 500°F. Slide one of the pizzas on parchment onto the preheated pan and bake each pizza on the top rack at 500°F for 10 minutes, one at a time. 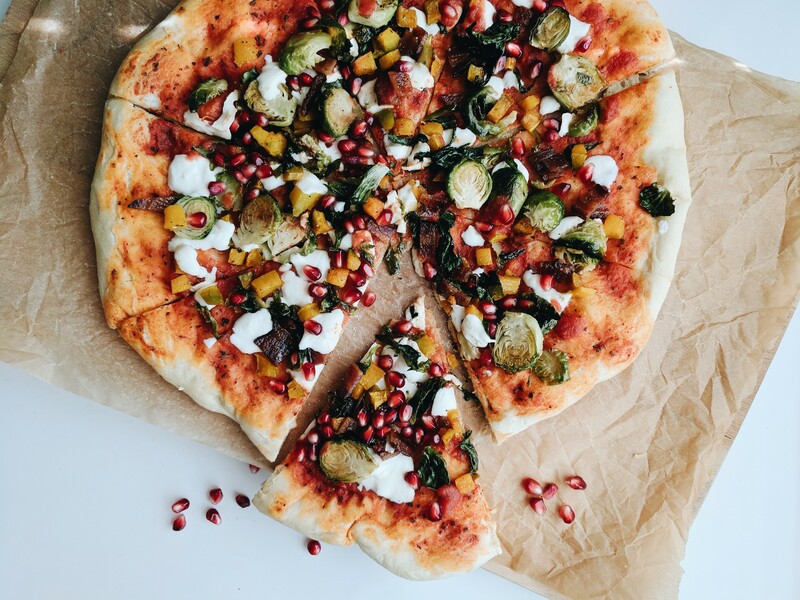 Remove the par-baked pizza from the oven and top with the Brussels sprouts, squash, cooked and crumbled bacon, and pieces of fresh mozzarella. Return the pizza to the oven and cook until the cheese is melted and the crust is lightly browned, about 4 minutes. 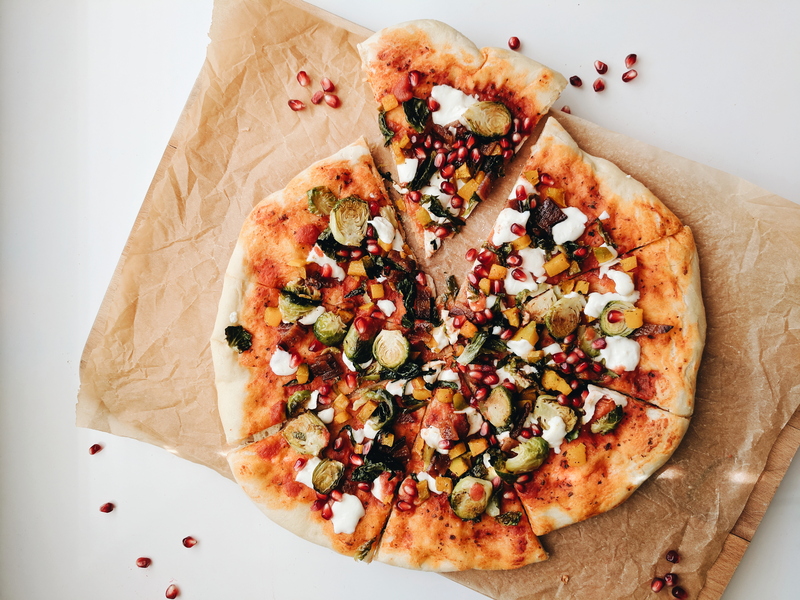 Top the pizza with pomegranate seeds and serve. have to admit the pizza looks fantastic and the photos are amazing!